If you want to be informed about FRACKING, you might want to watch this video. Just recently I was driving home from Winchester and noticed a very odd situation at the base of a very large hill. A man was leaning against a three-wheel cart, apparently contemplating ascending the hill. He was obviously very hot and tired. I drove by, then continued up the hill but at the top turned the car around and drove back to where he was to see if he needed any assistance. I parked behind him barely off the road, got out of my car and walked up to him to asked him if he was ok. He was looking for a place to set up his tent to stay for the nite. I told him Capon Bridge was just a half mile ahead and that maybe he could find a place to stay there. I suggested the large field behind the fire hall and told him I would stop in town to inquire about his staying there. He was relieved that there could be a place to camp that was not far away. I gave him my phone number and told him to contact me when he made it to Augusta which is where I live, 12 more miles up the road. After leaving him I drove to Capon Bridge to asked someone at the rescue squad if a traveler could set up his tent behind the fire hall for the evening. He said “no” but directed me to a field behind the local bank. I asked him if he would show Cliff, the travelers name, to the site when he came into town, and so he agreed. 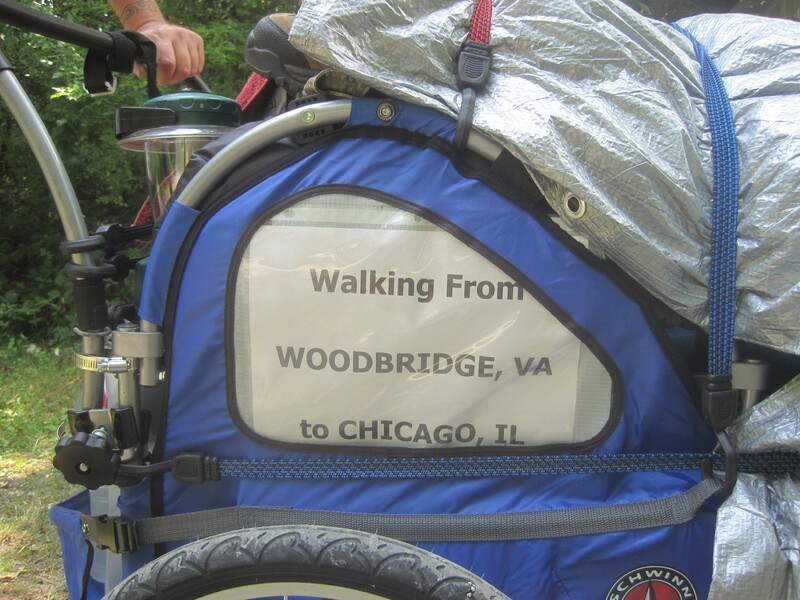 Cliff is from Wales and is traveling from Woodbridge, Virginia to Chicago where he hopes to pick up the legendary route 66 and then head west. I have picked up many bikers pedaling through our area and given them a place to stay, but I had never picked up someone pushing a three wheel cart weighing 100 pounds up our West Virginia hills. Cliff did not at all fit the profile of the average traveler. He has several small ear rings on his nose and ears along with a scattering of Celtic tattoos on his arms and legs. He is carrying a little more body-weight than the typical traveler and his head is shaved, so he is probably not someone the average person would take into his home but I am not the average person, so I offered Cliff a place to stay when he made it to Augusta. I forgot to mention that it was somewhere close to 95 degrees in our area at the time which definitely made his travels much more difficult. When Cliff was about 3 miles from our house he called to check in. I asked him if he would like me to come to get him since it was so hot; he agreed it would be a good idea. After bringing him home, he showered, and then we set down to get to know each other. Cliff was a fascinating person with very distinct ideas that reflected his home country and culture. It was a wonderful evening, and the conversation flowed for many hours. We looked at the weather report; it appeared that the temperature was going to be brutal the following day so he asked if it would be possible to stay another nite until the temperatures moderated. I agreed it was probably a good idea. 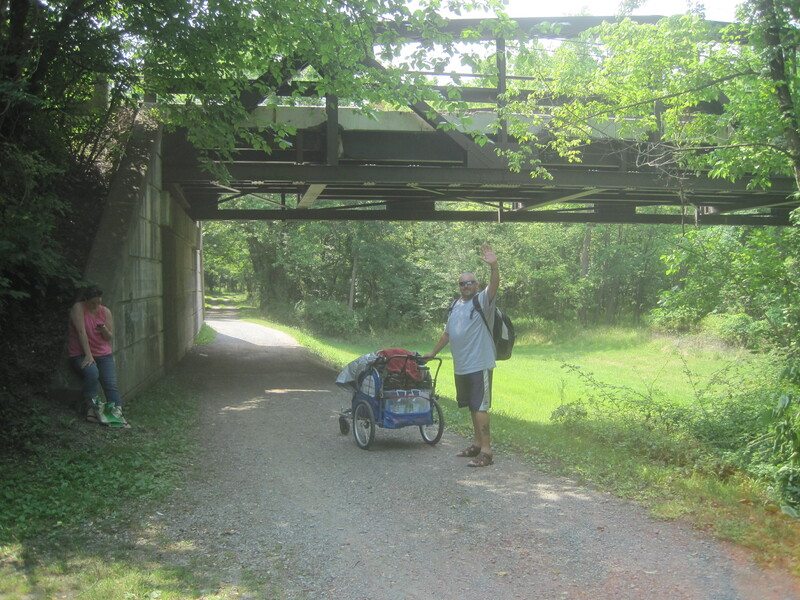 After listening to Cliff’s story, I told him it would be to his advantage to get to the Chesapeake & Ohio Canal, follow it to Cumberland and then get on the Great Allegheny Passage which takes you all the way to Pittsburgh. He agreed with my assessment; I told him I would drive him to the trail so he could avoid the terrible traffic on route 29 north. 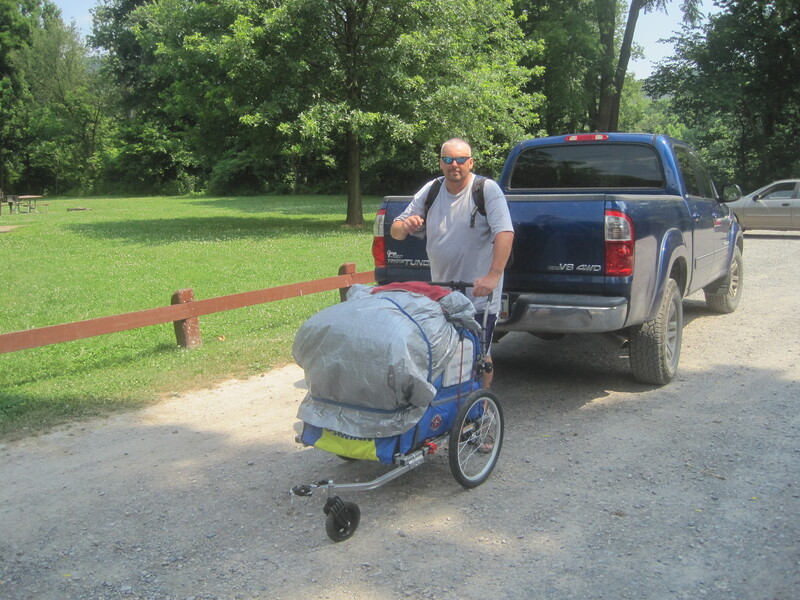 On Friday morning we loaded up the truck with his 100 pound cart and drove to Paw Paw where he could pick up the trail to continue his journey. I call this blog, PERCEPTIONS, because it dawned on me that if I drove past Cliff because of his ear rings and tattoos, I would have missed a meaningful encounter with a wonderful person. So often in our culture we make snap judgements based on the most superficial impressions. I know that we must be careful who we bring into our homes, but we Americans watch far too much sensationalist TV. Most people are good people; and I have found the adventure travelers to be some of the best and most interesting people I meet! Sue and I have been helping people for over 30 years and we have not had a bad experience yet; that must say something about the nature of the people traveling down route 50. As we were leaving Cancun behind, the clear blue ocean seemed to be saying good by as the big 737 jet made its way through the cloud cover to the clear blue sky-way that took us back to America. 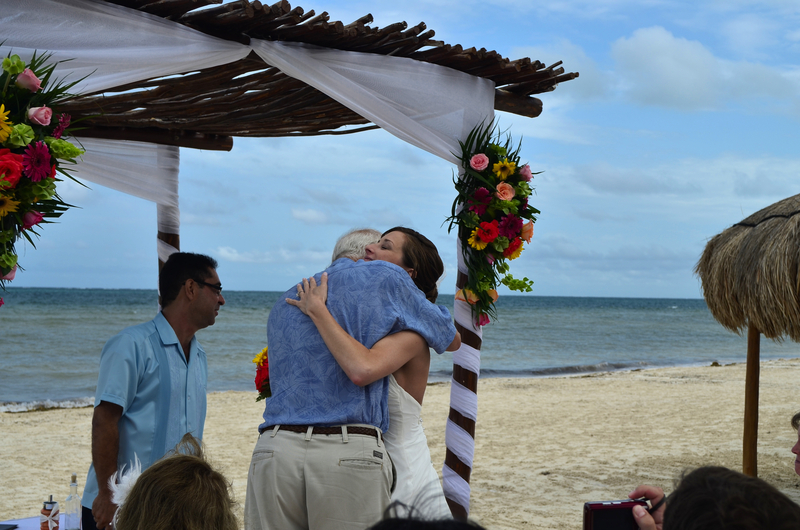 Our trip to witness the marriage of our daughter was a rewarding and eye-opening experience. The country of Mexico is a vast area of undeveloped land outlined with beautiful coastal areas with a sense of human energy I have not felt in a while. We stayed in a beautiful all inclusive resort that made us feel like royalty. Most of the Mexican people live in poverty with very high unemployment and little chance of climbing out of their current economic status. In the midst of this poverty was our resort, the Azul Sensatori, clean and sparkling, with no sign of the hardships that were on-going outside the walls of the resort. The rooms were spacious, the pools crystal clear and the workers, who were the energy that powered the resort, a constant source of enthusiasm and excitement. 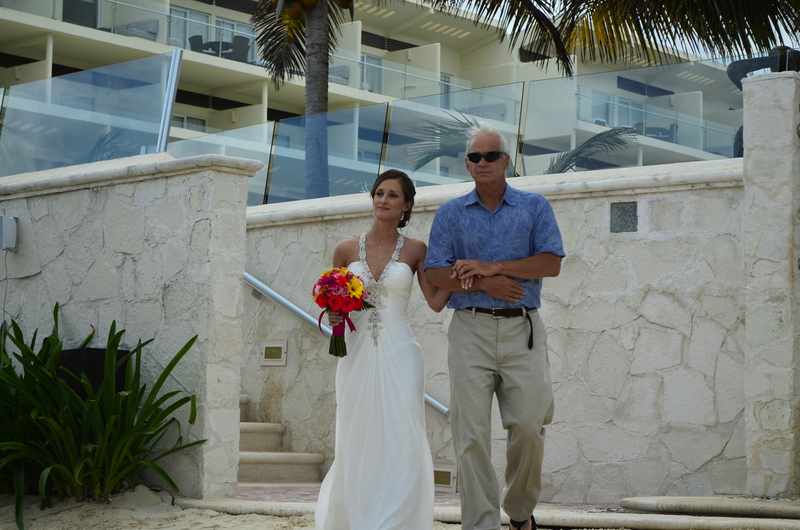 Although the marriage of our daughter was a beautiful event, I can not help but feel the that something was inherently wrong with the human suffering that occurs in parts Mexico and other underdeveloped countries. Make no mistake that the people of Mexico who work at the resorts seem to be very happy with their working conditions, but I wonder how much of their happiness is simply a charade preformed for the seemingly rich visitors that they served so willingly. I found myself wondering what thoughts were running through their minds as they smiled, said hello, and continued to work. The area around Cancun was at one time extremely poor and underdeveloped but with the advent of the tourism industry much foreign money now flows into the country. In our travels we saw first hand some of the living conditions in areas outside Cancun and I would say they were extremely poor. Jobs are scarce and the chances of getting a job that pays well seems to be slim. For the lucky folks who are employed by the tourism industry, life is good but these men and women make up only a small percentage of the Mexican population, hours are long, job security low, the pay is marginal and little time is left for family or leisure. So the question presents itself, is the intrusion of industry or tourism that uses cheap third-world-labor and resources for the benefit of wealthier countries good or bad for the folks employed? This happens all over the world with China, Mexico and India leading the way with a poor labor force. Many of the goods we buy are made in third world countries by labor forces that are little more than slave labor. On a more positive note the third world country will gradually join the world of wealthier nations but it is almost as if they must pay their dues by sacrificing much of their population in the initiation process. During this process a few individuals become extremely rich on the backs of an underpaid and under-supported work force. During my five days in Mexico I saw nothing but happy, content and hard-working Mexicans and other nationalities. This leaves me in a quandary, I do not know whether to condemn this process or condone it. Who am I to judge what is good for a culture? The people living in developing countries who are struggling to climb the proverbial ladder of success and live the American Dream have every right to do so. I still have a hard time being waited on as if I am better than another human being. On a more positive note, the wedding was beautiful! 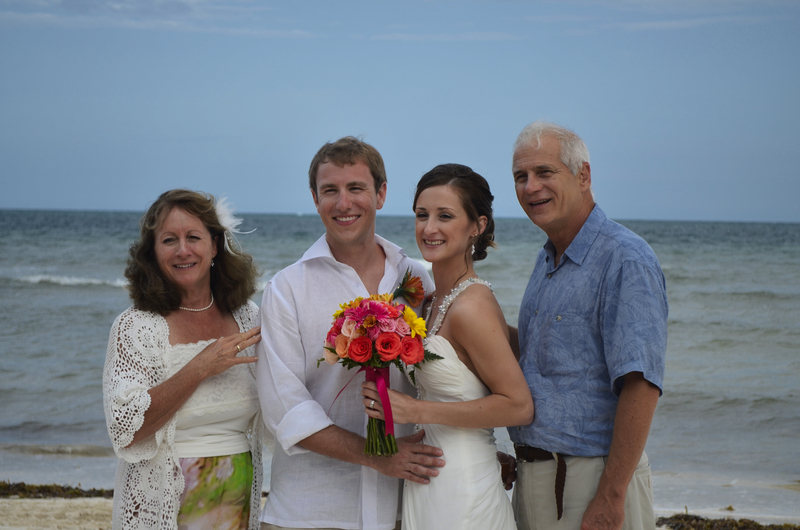 On June 18th Betsy Eileen Streisel and Thomas Edward Eanes exchanged the vows of marriage on a beautiful beach in Cancun Mexico in front of a small group of friends and family under a partly sunny sky. Old man weather was on his best behavior and everything went flawlessly. Our family keeps growing, bringing more wonderful people into our lives. I guess this is one thing that every family shares, rich or poor. Check out the amazing pics my son took. Our family keeps growing and growing. What a great feeling that is! If you want to see more pictures, go to this site. I apologize to all three of my readers for not haven written anything for a while. I have several blogs written but they are not quit ready for prime time. Once my daughter Betsy’s wedding reception party is over in two weeks I will again attempt to bore you to death with my dribble! If you are really bored, go back and read my blog on boobies or walmart. I have written 181 different blogs so there must be something to amuse you!